Precision machined stainless steel bomb inserts in copper corrosion bath for testing aviation fuels and natural gasoline. 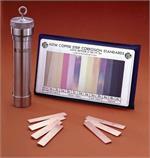 Withstands test pressure of 100psi (689kPa) per specifications. Threaded cap with O-ring gasket and knurled circumference tightens by hand to a positive seal. A 1 ⁄8" groove in the bomb threads permits safe, gradual release of pressure when opening the bomb.